Cupcake Mumma: Saturday is Caption Day! Never joined in with this meme before so here goes! 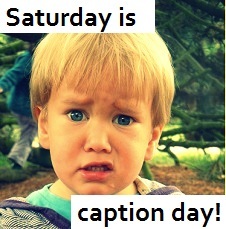 Click the badge below to link up your own picture for fellow bloggers to caption and to view the funny! This is the smile you give mummy to get what you want when you want! little bro - thats nothing you should see whats on your head! We're ready for winter...wonder if the rest of England will be able to cope as well as we will be able to?! Girl: aww you're so sweet! Fancy a crisp? They were looking very pleased with themselves after finding winter hats were on offer in their favourite store. eeeeee...what happened to your hair sis? Don't laugh at me till you've seen yourself! You need to work on the grin then mummy will give you a bag of doritos! "And that, my dear, is how you accessorise."